▷ Best Grey Highlights 2019 ¡Photo ideas & step by step! The grey highlights are not the most common highlights, because we have the believe that It´s our grandmother´s style and we are very wrong!. Every year the fashions are renewed and as time goes by it seems Highlights are the most daring style. 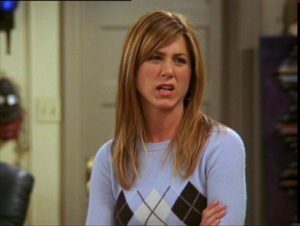 You can make their your own and not use the traditional ones, even though we love Rachel Green´s highlights from the 90´s, we are taking more risks using colors that haven´t been used before . The last year celebrities and very famous icons have used very unconventional hairstyles using pastel colors or as I prefer Unicorn Hairstyle. This fantasy colors exploded as a trend thanks for Tumblr Girls and Punk Rock singers, thanks to them this trend has increased significantly. Nowadays, the colors of fantasy colors quickly sell out in stores. 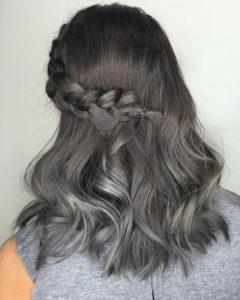 One of the most highlighted and unique tone has been gray, a color that was previously considered unwanted in a woman’s hair, but has recently become a very popular shade to wear. And not only this color triumphs among daring women, the gray Californian in men is a trend, many choose to wear this flattering color. 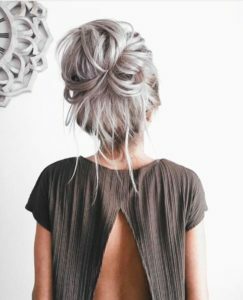 Among all the ways of wearing the gray that exist always stands out more a mix of grey shades to stands out your hair´s life, beauty and elegance. 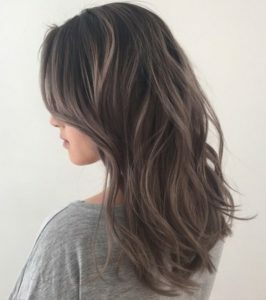 How to get perfect gray Californian highlights? The process is basically the same as for all the highlights, with a slight difference. You will need to use more bleach than the usual, especially if your hair is black or dark brown. 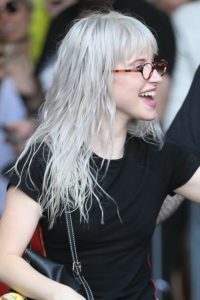 This makes this type of gray wicks more suitable for girls with blond or light brown hair, but equally ideal are the gray highlights in gray in dark hair. As for the length, this trend is great both in long straight or curvy hair and short bob hairstyle. Bleaching involves significant damage to our hair, especially if we have to use a large amount and also dry hair. If you make the decision to apply this color to your hair you must have in mind that you will have to invest a lot of time in maintaining and repairing your hair, through masks, moisturizing treatments, keratins, etc. I highly recommend you to use these products at least twice by week and leave them around 30 minutes to let them act. 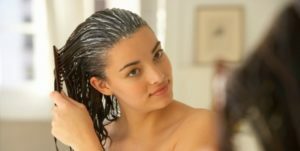 Trust me, those 30 min will make a huge different in your hair health, you only need to dedicate a little amount your week routine to take care of your hair. If you are a very busy girl, you can apply it and do others activities in your house while you wait. Even with the little bleaching problem, this hairstyle has an advantage; you will look stunning and really beautiful! 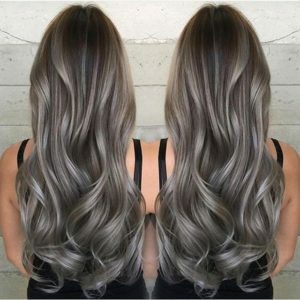 Regardless if your hair is light or dark, whatever the length of your hair or your skin tone, this color looks good in all type of skin, it will never look fake, because, grey is a natural hair color in the end of the day. 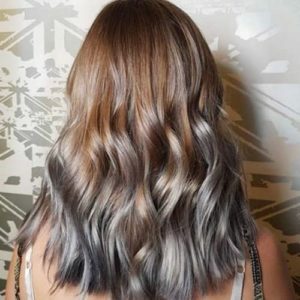 To achieve the desired shade of gray you will probably have to go through several discoloration processes, which will eventually leave your hair a dull yellow almost white. 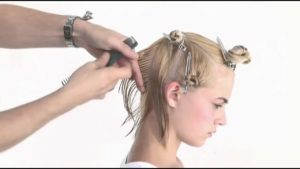 Our advice for you is to find a good specialist to guide you through this process, because, if you let you hair in hands of the first stylist you find, it could be a huge disaster. So, make a research on Instagram and ask your friends for a really good stylist. Once you are at that point you can apply the shade of gray you want. Many girls are aware that exist different shades of gray but doesn´t know how much time they have to let the tint do the wanted effect. Some are more intense, others clearer and those that are less conventional are silver or platinum highlights and some of them are blonde. You can find pastel gray, pink gray, silver gray, blue gray, purple grey and many others interesting combinations. All of them will give you an unique and different tone to your hair and skin tone. Our recommendation is that you think well what is what you want and the color you think look best to your skin tone. The hardest part is to decide between the huge range of options. 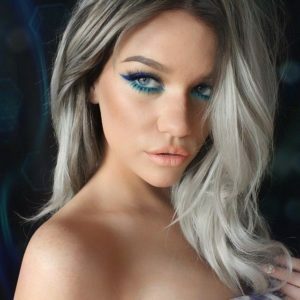 Once you have done the hair discoloration is only a matter of applying the gray tint you have chosen and dare to show off your platinum mane without shame. Can I do them myself or should I go to a professional? Well, this is a frequent question among women who want to wear this style. 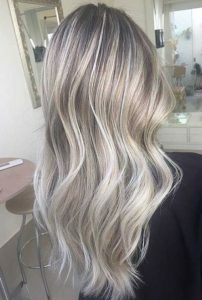 Californian highlights by themselves are not complicated to do, but, the hardest part is to manage the bleach and many girls have committed mistakes by making them as their own, because, they don´t research that much. Darling, if you want to look like the picture on top, you will have to study all types of dye to manage the enough technique to do it in your own hair without failing in the process. If you have worked with decolorizing before and you are an expert, almost a professional in dying hair, you can manage this highlights and finish them without damaging your hair. Then you can follow this guide on how to make gray or platinum highlights step by step at home. Select sections of your hair that you want to bleach. If your hair is dark, color it until at least 8 shades. Apply the discoloration tincture from the tips to the root. Wrap the wicks in aluminum foil to concentrate the color more on the tips. Wait about 40 minutes and remove the foil. The result in dark hair should be of an orange tone and in clear, honey-colored tones. Repeat the process and this time wait 30 minutes. Finally, apply a nuancing tone to achieve a silvery or gray tone. But if like most girls you do not have deep knowledge in styling and discoloration, you won´t be able to handle this hairstyle, the best thing you can do is go to a professional. They will take care of in a short time to give you what you want without harming your hair. In addition they will give you some advice and instructions that you must follow to maintain your gray tone in excellent state and very healthy and shiny. 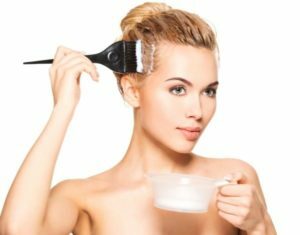 It is very important that after such an abrasive process in your hair you dedicate a short time of your routine to take care of it to repair the hair fibers. Hydration is very important, constantly apply professional and natural masks, at least once or twice a week. Use ampoules and shampoos without salt, as well as natural oils that provide shine and essential nutrients. 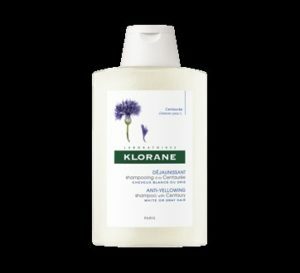 Klorane is a special shampoo for gray, silver and platinum blonde hair. It will help you maintain you beautiful dye by illuminating you hair. It´s a very soft and gentile shampoo and will keep your highlights illuminated and radiant. It will take care of your hair and your hair won´t turn yellow if you use it!. It´s not very expensive and you can even buy it online or hair salon boutiques. Reduce as much as possible the use of the dryer and iron, and if it is necessary that if use them then apply a mask of heat protection to your hair, this is an excellent way to keep it protected from high temperatures. In addition you should cut your hair frequently, at least once every eight weeks, because the bleached affects burn your hair tips causing the so-called split ends. Another idea is to reinforce all these tips with a healthy diet, because everything you consume will be reflected in your skin, nails and hair, and you can even add vitamin complexes to your daily routine, to strengthen the hair from the root. Even if an effort is needed to keep your hair pretty and healthy, we can assure you that when you see the elegance of the classic beauty of the grey highlights, you will understand their worth it. If you follow these steps to the letter, I can assure you that you will be the sensation of the moment and you will catch the eye of everybody, because the will be focusing on your fabulous hair. 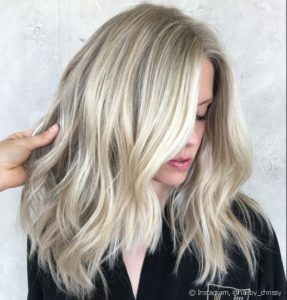 Want to know how to make these beautiful highlights? Learn how right here! Now it´s time to pick a look!. If you want something subtle, but very unique, classic and charming you can try with this highlights variation. Some girls have tried this style to then encourage themselves and choose a more daring hairstyle. So, if you want to experiment something new, you can try this brownish grey highlights and you will not be sorry!. If you have blonde hair this is the best option if you want to look modern, chic and fresh. I really recommend this look if you work on an office, because you will conquer and catch everybody’s eye!. I highly recommend this hairstyle to add shadows to your hair, if you don´t have a huge amount of hair, this hairstyle will give you a lot a volume. Try using Platinum highlights with you Grey Highlights to also give light to your hair and It will look healthy, shiny and strong!. 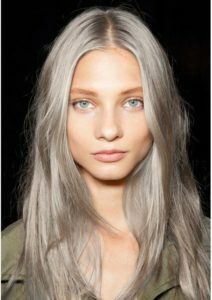 In this case, Grey highlights will give light and volume to your hair; I highly recommend a shade of grey similar to ashes grey and you will slay with this look!. Everybody will love your new look. You won´t regret it. My advice is to leave the bleach and tint enough time to let them work. Because, if you don´t let them act enough time your grey highlights will be very light and you won´t probably be able to see them. Sometimes using highlights in black hair is hard because any kind of highlights will look fake and that´s what we don´t want to do. Highlights are supposed to light your face and also give volume and depth sensation, so I recommend to use it mostly in your tips in the front of your hair and in your back a big amount a highlights and you can also try with an ombré or a somber!. Trust me, you won´t be sorry if you try them. With this hairstyle you won´t have to be really careful about being subtle!. This kind of highlights looks very pretty when you have blonde hair or light brown hair, because It won´t look like two shades of color. This highlights will give you the best of both worlds, light and shadows, try this hairstyle with a curvy or wavy style and you will look like a celebrity and It doesn´t takes too long to do it thanks for the messy hairstyle!. 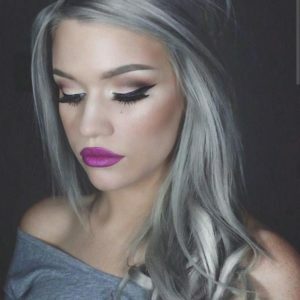 I recommend this look for Dark brown hair and Black Hair because you will have grey highlights to give light and brightness to your hair and the ashes highlights ad volume to your hair, it works the same as Silver Highlights with Grey Highlights but in this case is for dark hair girls!. 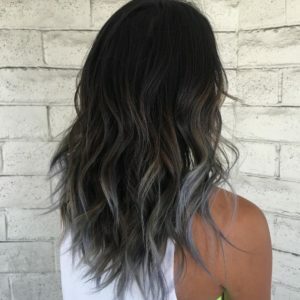 Right now is very trendy to try Sombré hairstyles, it´s like an Ombré but a little more natural and this technique blends the colors with your natural hairstyle!. What are you waiting for to try this?. If you liked this comment please share it with your family and friends!. They will appreciate it because they could be thinking in changing their looks, same as you and they want that little push. So, share and tag them to inspire them to take this change and conquer the world!. Don´t forget to check our blog every week, because we are always writing about very good beauty advices to keep you updated!.